To some it would have been the most boring place in the world, but to me it was Aladdin’s Cave. It was March 1996 and I was in the deepest, dimly-lit reaches of the astonishingly extensive archives of the Cinémathèque Française. My guide down these subterranean corridors of cinematic archaeology was the relatively recently-appointed new director of the archive, Laurent Mannoni, whose knowledge of the technology of moving images stretched from way back into pre-cinema times, right up to the present day. Unlike his predecessors, he was keen to explore the Will Day Collection (see previous post); to better understand it and let the public see its treasures. To this end, he had been inviting various experts over to Paris, who had specialist knowledge, to help with the process. Always return to absolutely the earliest, original sources you can possibly find for whatever you’re investigating. Don’t rely on other people recycling or paraphrasing sources as they may be lazy and/or biased in their research. If at all possible, get your sweaty little hands on whatever technology you’re interested in, to find out how it really worked in practice. Don’t just rely on patents, drawings and memories. If that’s not possible, rebuild it yourself. I can honestly say that this philosophy has guided all my research ever since, although I bow to Stephen in the application of B) as he understands this stuff so much better, having raised tinkering with mechanisms to quasi-mystical levels. So when I heard he was off to Paris to have a close look at the Will Day Collection I was quick to suggest I might come along and shed a little bit of light on anything to do with William Friese-Greene and his early mentor and collaborator, John Rudge. Happily both he and Laurent agreed to this. And equally happily, it turned out I was able to make myself useful. Ranks upon ranks of shelves, stacked to the ceiling with every conceivable device for capturing moving images or displaying them; from optical toys to massive Technicolor cameras. It was bewildering and thrilling for someone such as myself, in love with cinema both as a viewer and as a filmmaker. We looked at quite a variety of items that I had previously only read about in books; amazing creations that made pictures move, well before cinema. Then, somewhere in the midst of all of this, Laurent produced some artefacts I had barely dared hope were still in existence, given that half a century had passed since they last saw the light of day: some of Friese-Greene’s first films, shot on celluloid. It was quite something, after two years of being buffeted by conflicting waves of conjecture and assertion about the works of William Friese-Greene and all the debate about what he achieved or failed to, to finally be confronted by the incontrovertible physical manifestations of his efforts. By rights, these films shouldn’t have even been there. In any normal circumstances they would have long ago gone to the archives of the Centre National du Cinéma (CNC) in Bois d’Arcy to be lovingly restored and preserved. But nothing to do with Friese-Greene is very normal. Such was the rather stealthy way that the Will Day Collection had originally been acquired, combined with the indifference to its Friese-Greene treasures by the then director, topped off with the outright hostility of some British historians in the ensuing years to giving any credence to claims of Friese-Greene’s importance in the invention of moving pictures, that absolutely nothing had been done with them since the day they had arrived in Paris in 1959. Long before then, Will Day had decided to conserve these films and make them available for display in exhibitions by keeping them between large sheets of glass in long strips. What I saw on that day in 1996 was presumably how they had remained for around seventy years. It seemed he had used some sort of gum to hold them in place, or preserve them, which had left brown, sticky residues. In addition to which, the years themselves had taken their toll on some of the earliest celluloid roll film to be fabricated, which was cracked and contracting. In fairness to Will Day, what he did may have actually kept them in a better state than if they had been left to moulder in a rusting film can all that time. Nonetheless, exciting as the moment was for me, I felt a profound emotional pang that no inanimate object had ever elicited from me. It was akin to coming upon a species of animal, thought to be extinct, only to discover it had been struck by a car and could barely limp to the side of the road. For Laurent Mannoni, I imagine that his situation with the Will Day Collection was like he had been bequeathed a neglected zoo by some eccentric uncle and was now trying to figure out which creatures most urgently needed his attention. I made clear that I felt these films should be one of those priorities. He promised to get them to the film archive for preservation straight away and, indeed, Michelle Aubert of the CNC made sure they got the necessary loving care to nurse them back to the fullest health possible. In fact, they made considerably more effort to conserve them than the British Film Institute was doing with its own Friese-Greene materials at that point in time. But, apart from conservation issues, what did these films show? We placed the first glass sandwich on a lightbox. 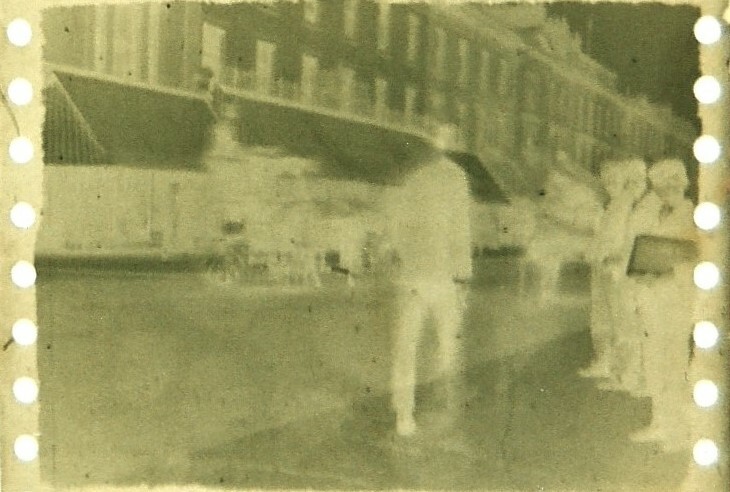 It was a sequence from the camera whose construction was completed in September of 1889, made along the lines of the British patent submitted in June that year (and granted in 1890) by William Friese-Greene and Mortimer Evans, originally entitled “Taking photographs Automatically in a Rapid Series with a Single Camera and Lens”. The pictures appeared to show people walking beside the River Thames, which didn’t correspond to any specific description of a sequence which Friese-Greene himself or others had mentioned in writing, but was presumably an early test. The size of the images was just as I had seen described by Theodore Brown, another ingenious cinema inventor who knew Friese-Greene and interviewed him for the Kinematograph & Lantern Weekly, which Brown edited, in 1909 That is to say: they were 2½ inches square (approx 65mm). One half of the sequence was mounted upside down in relation to the other and I could only look at a few frames at a time, making it hard to get a sense of it. The edges of the strips clearly showed the marks of the pin-wheels that the patent had proposed to help steady the movement of the film. I examined it thoroughly, but it was in a fractured state and I wanted to have a chance to view it properly once it had been restored. More to the point, I had that feeling you have as a child at Christmas, when you know the last present left is the most exciting one. I was impatient to move on to the other sequence. I had only ever seen fragments of it reproduced in various unexpected places, with no clear attribution or explanation. I’d had no idea if it still existed at all or, if so, as more than some clippings of a couple of frames. But here was a sequence of over fifty frames – that would therefore run for quite a few seconds. Certainly enough to get an impression of how fast and how well the camera that shot them functioned. The pictures were fairly evenly spaced and clear, and there were round, punched sprocket holes up the sides of the film, which didn’t respond to any camera that I, or Stephen, or Laurent had ever seen (and Stephen and Laurent between them knew a terrifyingly large number of film cameras). But these perforations did correspond to Friese-Greene’s own account of a camera he designed after the one he made with Mortimer Evans. Even as a deteriorated negative, viewed in less than ideal conditions, one could see this was a film of a city street in Britain, probably London. I’m pretty sure my heart started beating harder and I held my breath. Something about that film, which had survived total neglect and indifference, lost amidst thousands of other artefacts for decades, was special. Very special, I felt. Something about that film smelled of a Eureka Moment.